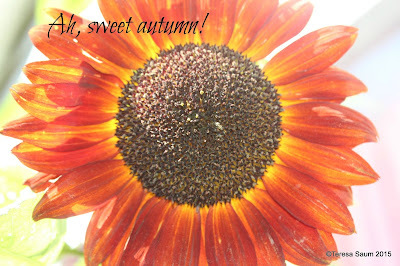 The Blog: Spellbound by our own imperfect lives...: Ah, sweet autumn! I love fall. I love fall food, fall clothes, fall flowers, fall holidays. There isn't much about fall I don't like. Maybe the shorter days, but even fall evenings are pleasant. It's been a good start to fall. I started a new session with my trainer, Gunner. He gave me quite a compliment this morning when he told me I jumped up off the floor better than a person half my age. Ha! Here's to strong thighs! I have a few sub days lined up. We'll see how that goes. One I signed up for was already cancelled. I signed up for an online writing class called The Spiral Path. Very excited about that. Kathryn and I are finally moving on our 600 words project. We have an appointment at one of the care facilities this afternoon. We tried to get a booth at one of the local festivals but were told we didn't really fit their notion of "art". What the hell. They let people in there who make bras out of dried corn kernels. That's art and oral history isn't? Maybe we should stage a rebellion and just set up a card table in a corner. Think they would have us arrested? Off to be a busy person. Make it a good day. Soak up these gorgeous fall days!